There is a particular style linked with antiques of French, a timeless chic which is hard to create or an offhand style which enhances a simple room into a space of beauty. For an antique piece, nothing can go wrong with a French mirror. It will depend on your preference which style or period you will decide to buy you mirror from. Our great collection of French Mirrors renders a varied and wonderful selection, right from frivolous, decadent Rococo and Baroque to romantic French Chateaux to sophisticated Neo-Classical or more. This range of beautiful, redolent French mirrors would have something to convert any space. With our wide range of classical mirror frames, you will get a stunning still reasonable range of French Overmantle mirrors. These pieces would compliment every shabby or classical chic room in a house. Browse our collection of these mirror styles that you might consider sitting over the fireplace. 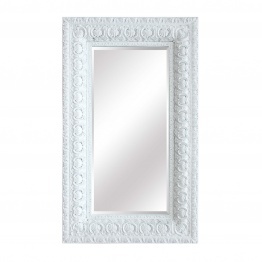 We assure that you will just adore our uniquely designed French mirrors with stunning carved detailing. You will surely find something of your taste or interests from our collection. We have a range of beautiful French wall mirror collection that is waiting to experience a new pride of place in your house. No matter whether you are searching from a French Wall mirror for bathroom, bedroom, guest room or hallway, you are assured to get an ideal antique piece of wall mirror that suits your style. If you want a taste of real divine, these mirrors can bring a graceful delight to your space. Whether you are looking for a French floor standing mirror for your hallway or living room, our exclusive collection of mirrors is ideal to bounce the light around your house interior. With tons of standing mirror options, we want to help our customers to find out an ideal solution for their house and style. You will get everything of your choice or taste from us. Our beautiful French carved mirrors are a great way to enlarge a small space. An antique French carved mirror that is stunningly crafted from walnut with its real beveled glass might be just what you want. They can create a dramatic impact as well as full-strangle designer styling in any space. With us, you will get a wide range of French oval mirror. No matter whether you are searching for a large oval mirror, small oval mirror or decorative oval mirror, we guarantee you would find something of your interest. A French mirror made from a solid brass with nickel finish or a sophisticated oval wall mounted mirror could be tilted to meet your expectations. Such mirror could be wonderful above a dresser, in an entryway or employed a vanity in the bathroom. Just add an understated and elegant touch to any space with such a sophisticated oval mirror. We want you to get things of your choice to boost the décor of your house.